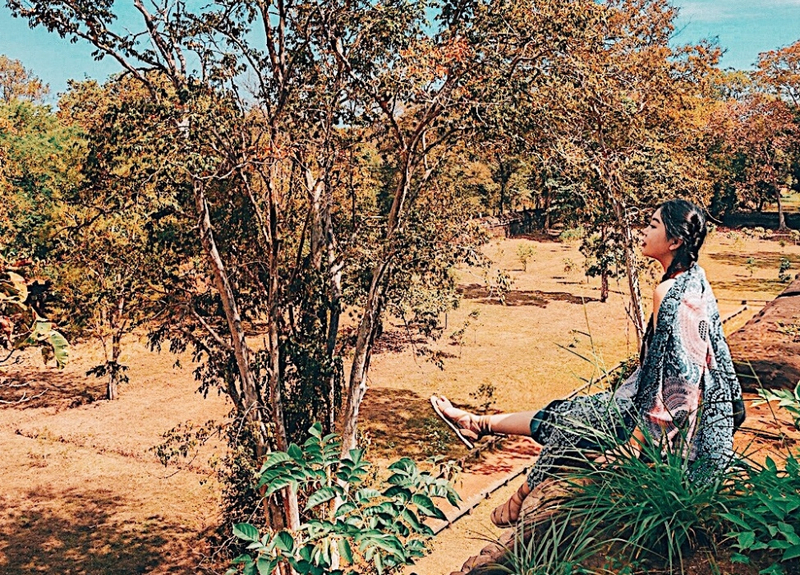 Hola If you are following my Instagram, then you should know I visited Malacca on last week. 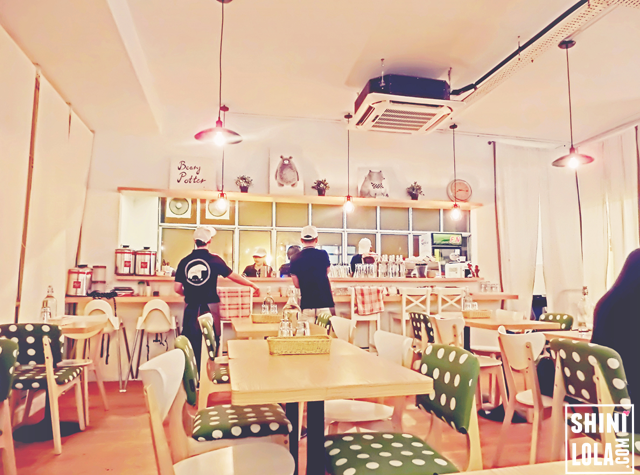 Melaka is a food paradise and it's actually quite near from KL. However, we know 1 day trip might be not enough. So we decided to stay overnight to try other delicious Malacca foods. 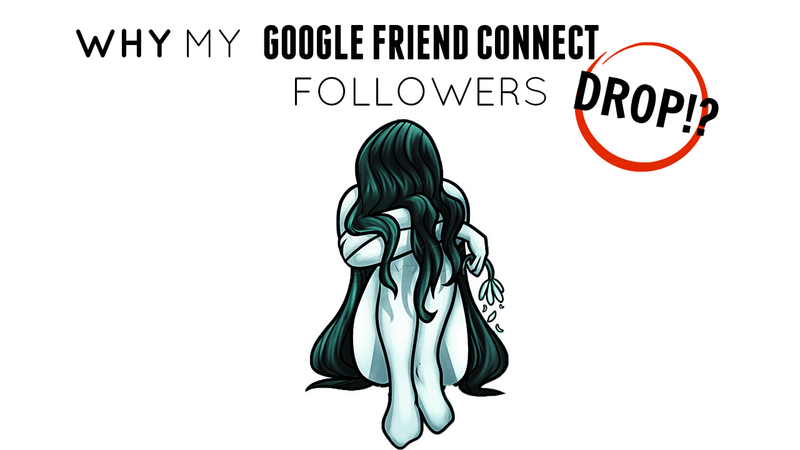 Hello If you're a blogger who using Google Friend Connect(GFC) widget in your blog, then you might experience a MAJOR DROP in your GFC followers in this month. I was shock when I saw 45 followers gone in my blog. I just came back from business trip before I noticed that so I thought do I do something annoying that caused some readers unfollow my blog? I was so frustrated about this and I decided to google and now I found out WHY. Google has made some changes to their GFC service. Previously, emails other than Gmail were able to follow via GFC. But now, if you don't have a Google account and previously followed via GFC you'll need to sign up for one and re-follow my blog. I'm worry that some readers might not aware about they are not following my blog anymore because of this issue. Not cool Google. It's not cool at all! Some of my readers might can't receive the latest updates of my blog post anymore because of this. Now they need to create a Gmail account in order to follow my blog. Some readers might found it troublesome to create another email account just to follow the blog to get updates. Annyeonghaseyo Yes! I'm come back with the #Korea post again. Remember I mentioned I visited Korea for the 3rd time in my previous post? This time I'm staying at Gangnam and special thanks to Banobagi Clinic for sponsored me accommodation. 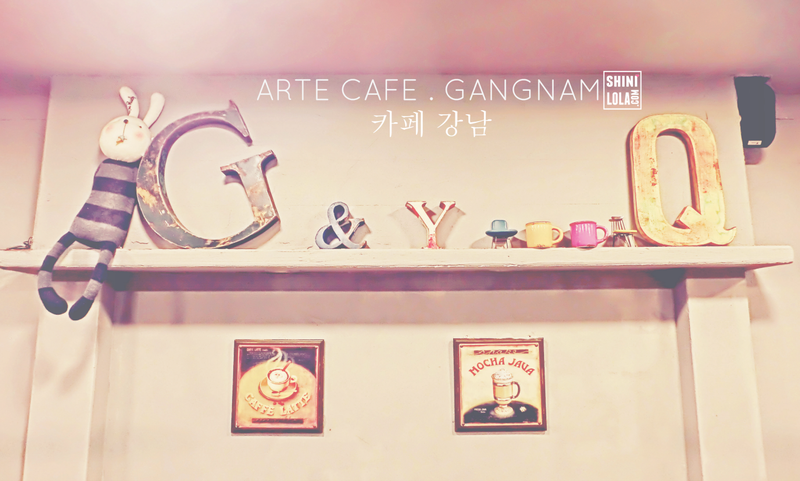 Today post is about a small and cozy cafe called Arte Cafe which is just located behind of my hostel. For your info, the owner of Beary Potter Studio Cafe got the idea of the ambiance and interior when he was travel in Kyoto. 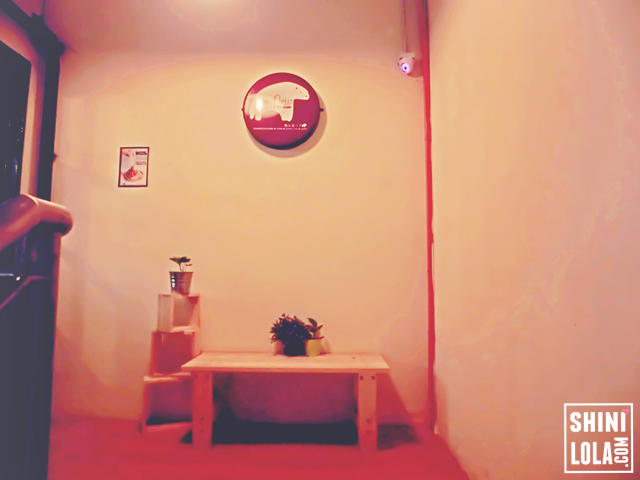 He visit an unique cafe which surrounded by plants in a ceramic pots. 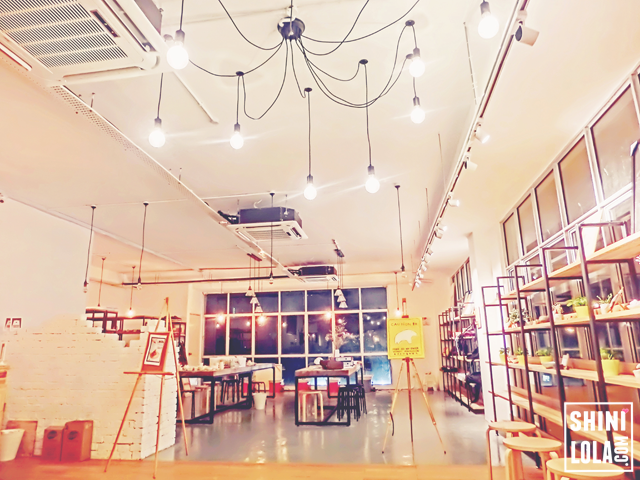 Their mission is to let customers feel cozy with the environment, at the same time enjoying their homemade plates. 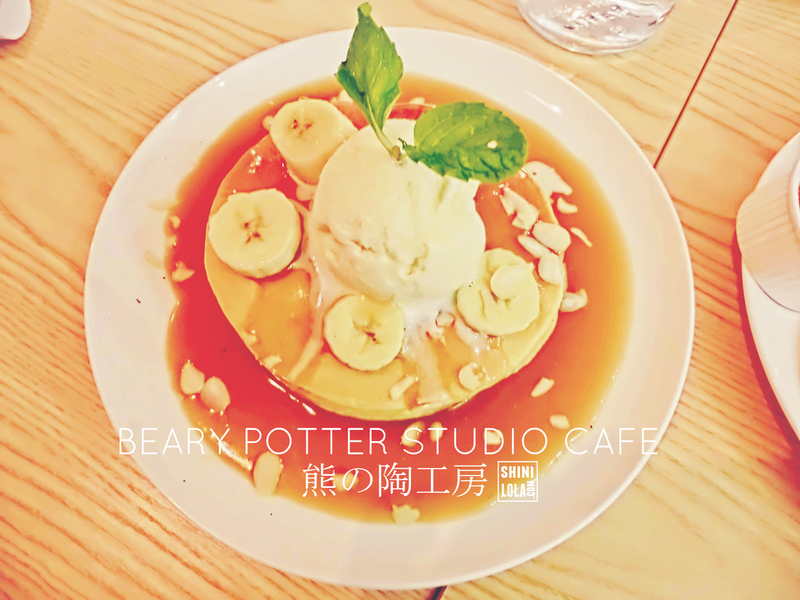 Basically Beary Potter is all about Japanese pancakes, coffee, pottery class and gallery. 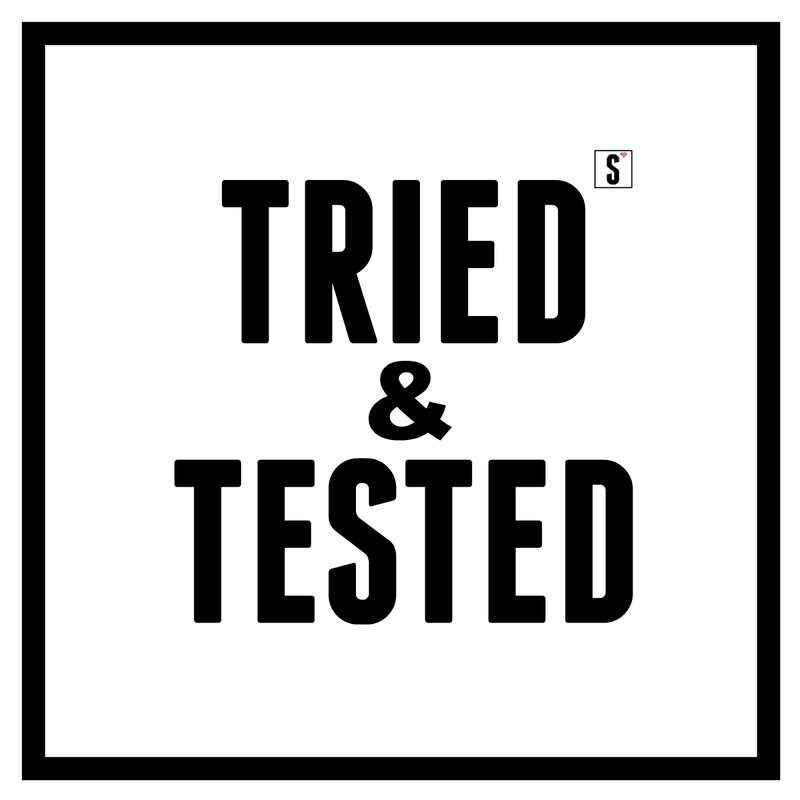 This is their super kawaii logo. Isn't it so cute? I like the way they decorate and hang it on the wall so everyone will have a look on it. Plus, yellow colour object is always caught people attention. 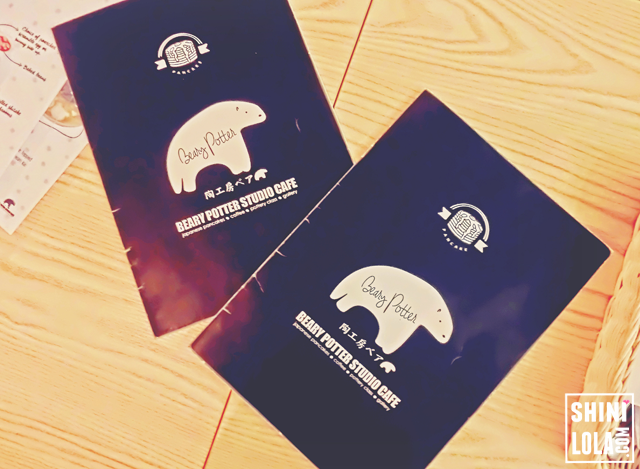 Some of you might don't know but I did mentioned at the beginning, Beary Potter providing pottery class as well. 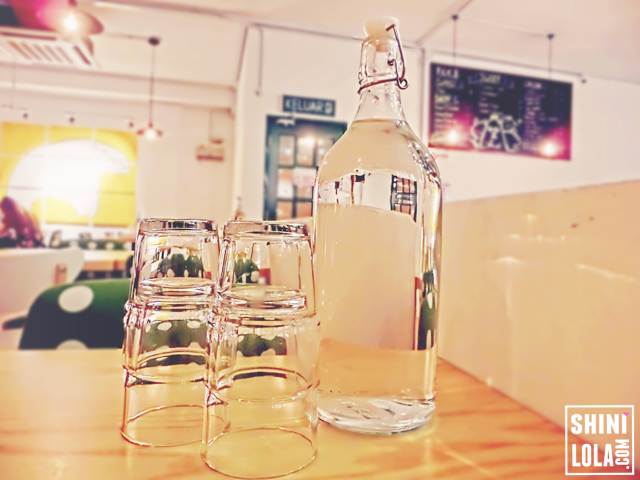 It did caught my attention when I enter the cafe because you can't found this at the ordinary cafes. My boyfie has graphic design background so he was interested on this kind of DIY objects. He even purposely get closer for a better looking. If you're interested to join their pottery class, please CLICK HERE for the class schedule. The kitchen is tidy and hygiene. 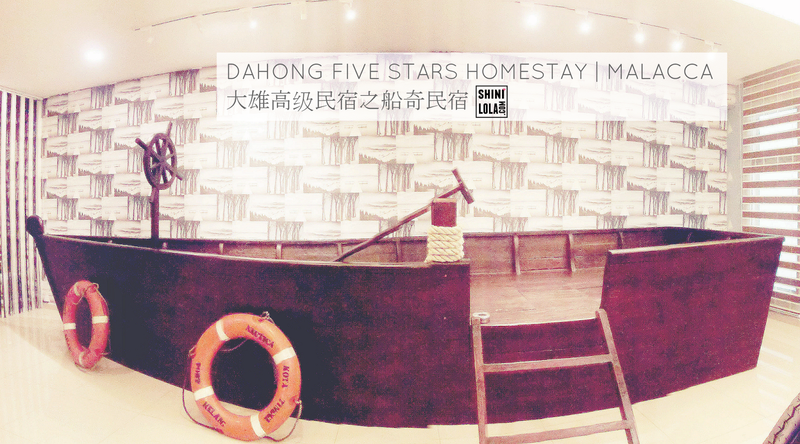 The staff are really friendly as well. I guess they purposely choose green colour cushion chair to match their plant theme. The polka dot was cute. Please noted that after you check out the menu, you need to go to the cashier for ordering and pay as well. We have no idea when we enter and had the seat. The friendly waiter came and inform us then only we knew. Ta-da! 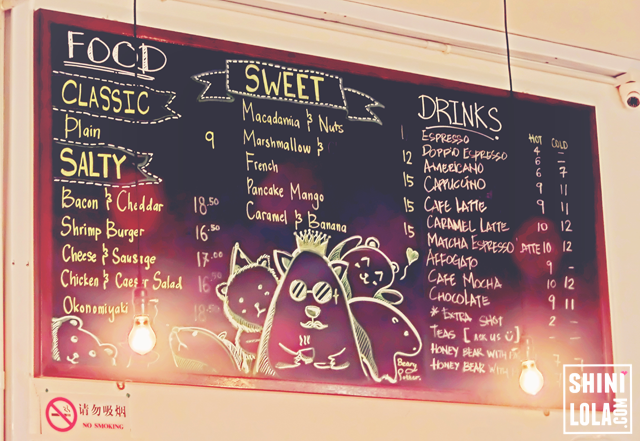 This is their board menu. Isn't it cute? 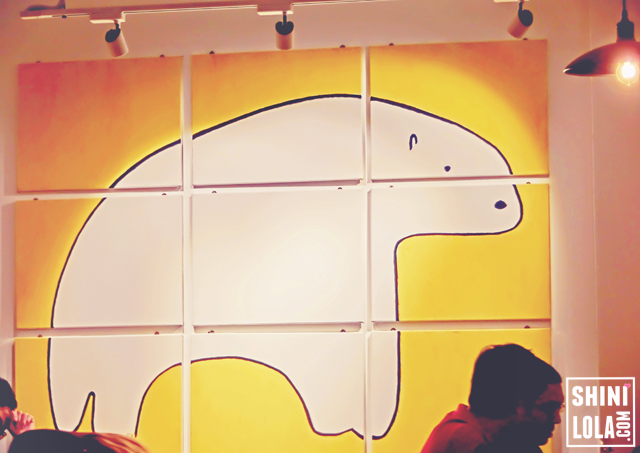 I really like the bear illustration because it's not the ordinary bear. I'm not sure it's drawn by the owner of his designer but it's cute though. If you thought they just have board menu then you're wrong, more menu is in the table menu. Yes, we seeing the cute bear logo again. 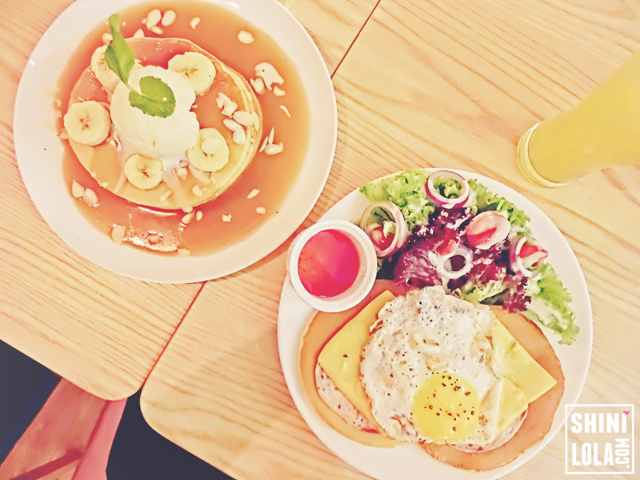 Check out how many variety of pancakes they have! 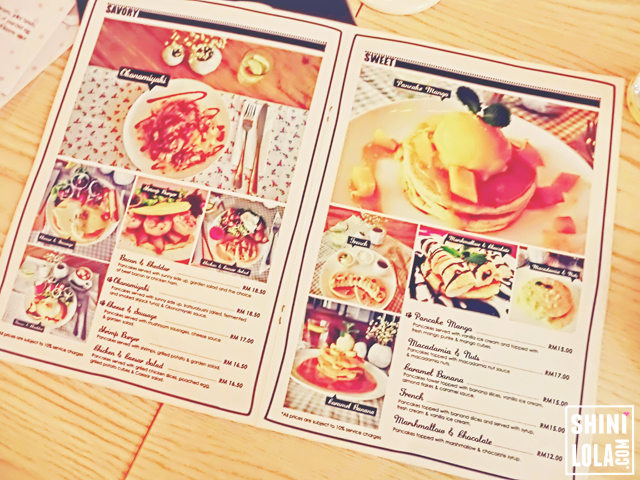 They having different flavours of pancakes such as plain, savory and the sweet taste. 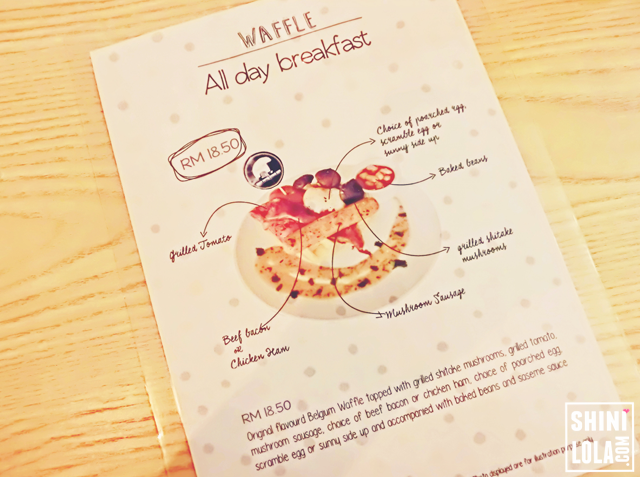 The price range would be between RM9 to RM18.50. If you think pancakes or waffles is served with the traditional sweetness then you might be wrong. 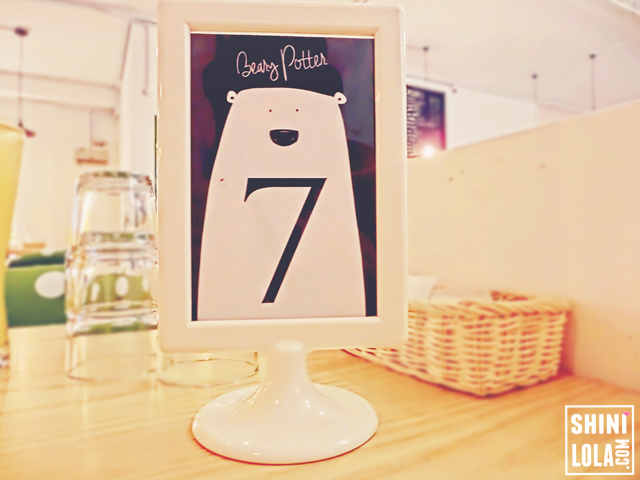 Beary Potter provides All Day Breakfast Waffle as well. 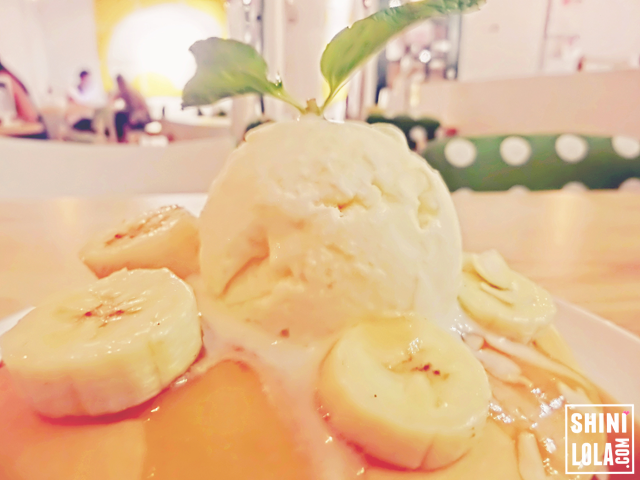 We didn't order this because this is our first visit and we wish to try other dishes. If we order this sure we will feel very full and unable to try another dish. 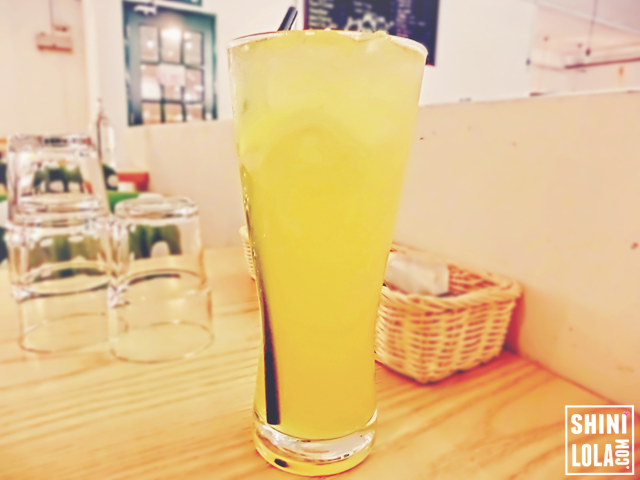 Feel not bad about this drink and the portion is quite huge. It might be a little bit sweet for people who doesn't like sweet stuff but it's okay for me. Ta-da! Our foods is here! 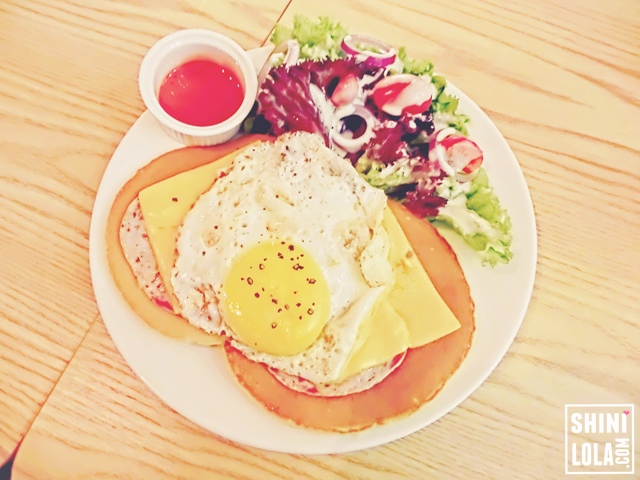 Pancakes served with sunny side up, garden salad and the choice of beef bacon or chicken ham. Comments | As a fans of egg, I LOVE IT! 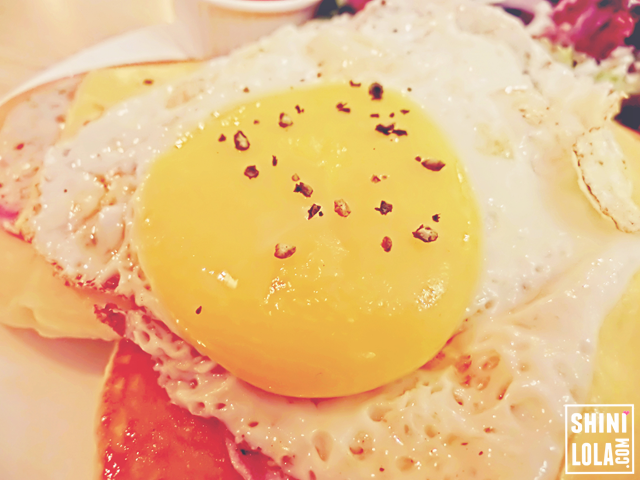 If you're loyal reader then you should know I always prefer the half-cooked egg yolk instead of fully-cooked egg yolk. 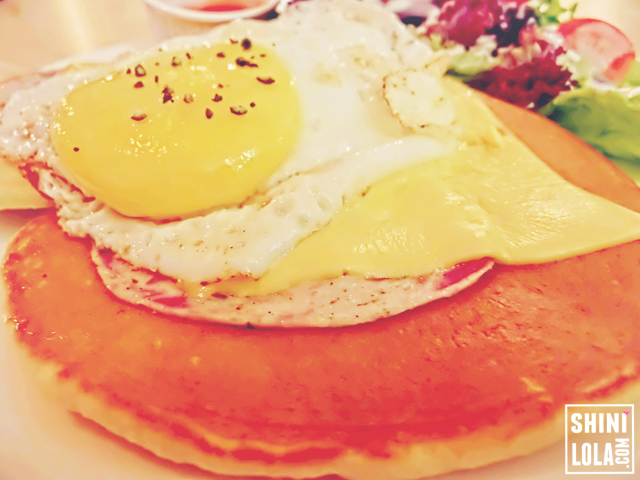 The pancake is soft and yummy. Since I don't consume beef so I choose chicken ham instead of beef bacon. Love how it match up well with the cheddar too. 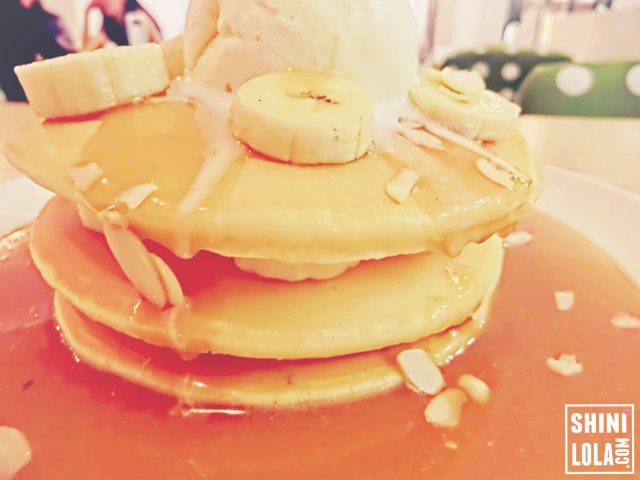 Pancakes tower topped with banana slices, vanilla ice-cream, almond flakes & caramel sauce. Check out the caramel syrup! Hola Since Chinese New Year is coming soon, have you girls bought any hair curler in order to set your hair nicely done? 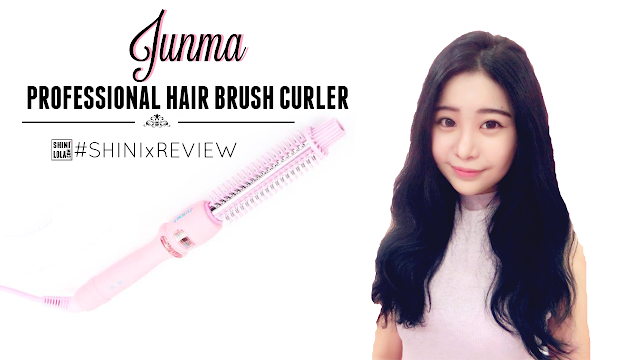 If you haven't, then you should check out this post because today I'm talking about Junma Professional Hair Brush Curler. Ta-da! This is it~ The bright really looks attractive right? I had another dark pink straightener but this would be my very first bright pink hair curler! 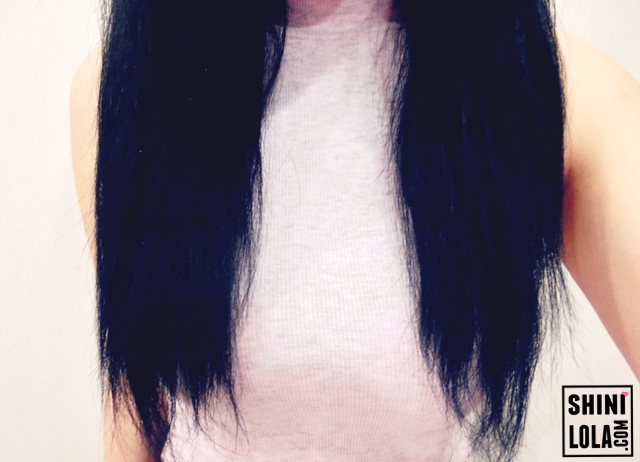 Yeah~ If you not a fans of pink, you may choose black colour instead. ✦ Refined by a special ceramic glazes, the nano-technology surface treatment does not hurt the hair and creates shiny curls. 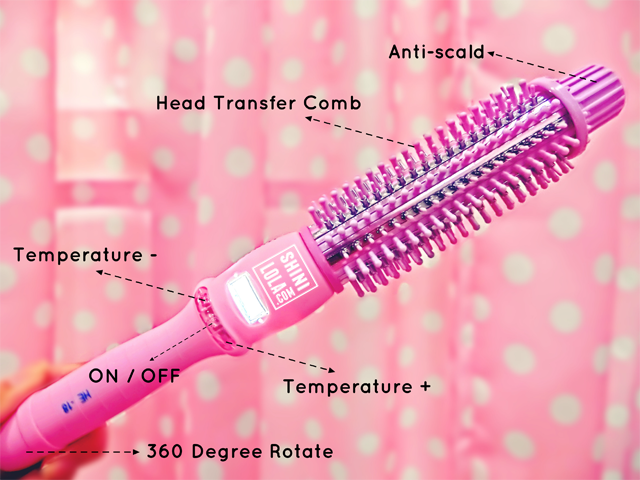 ✦ Creates salon curls at home! 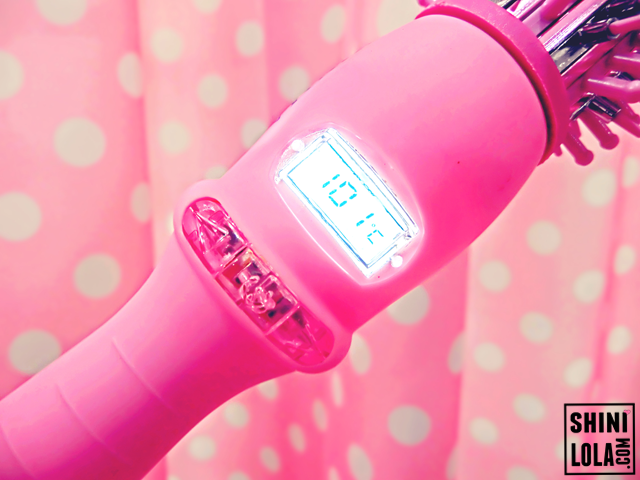 You can adjust the temperature by your own, press on the left to decrease the temperature while press on the right for increase. I set the temperature for 180°C and it will increase by its own. I'm quite impress because the temperature rise up very fast. 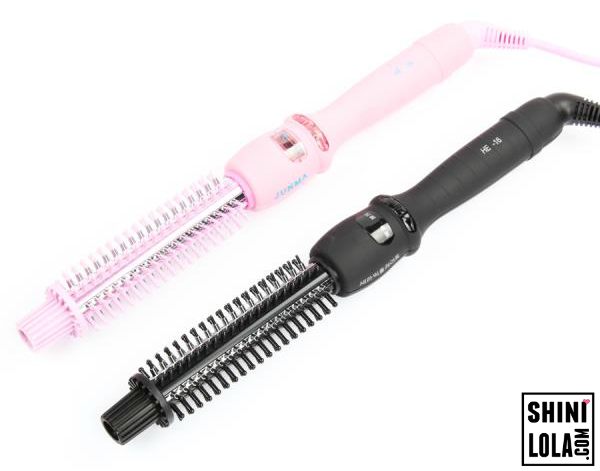 For the curling process, you may choose to create inward curl or outward curl. For my personal option, I prefer outward curl because it will looks more natural. 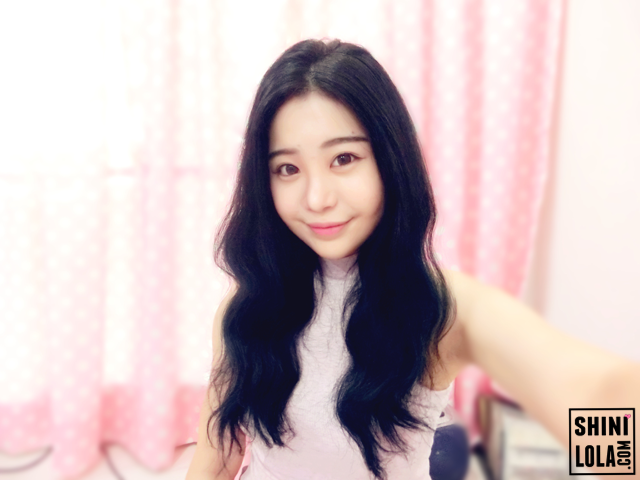 However, if you looking for more long lasting curl, I would suggest you to try the inward curl instead. The inward curl's final outcome will makes you looks more mature if compare to outward curl. Yuhoo~ This is the "before and "after" outcome. Do you guys love it like I do? 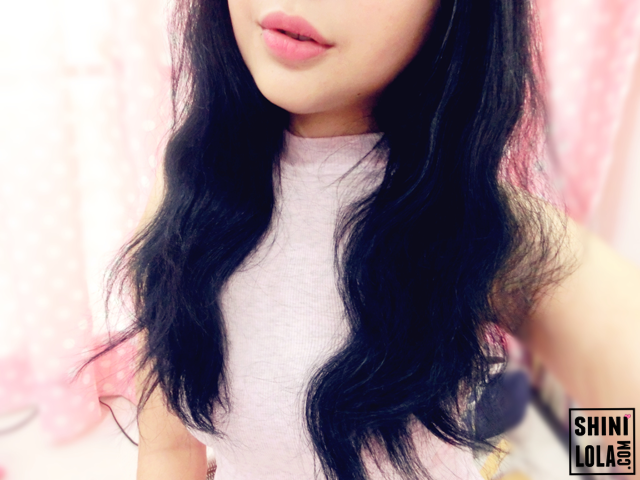 you may noticed my hair became shorter after curl my hair, it's normal because of the wave of my hair. Taking good care of our skin is essential. My mum always told me if you born with good skin condition, you still need to maintain it well or else your skin will get dry or saggy when you get old. 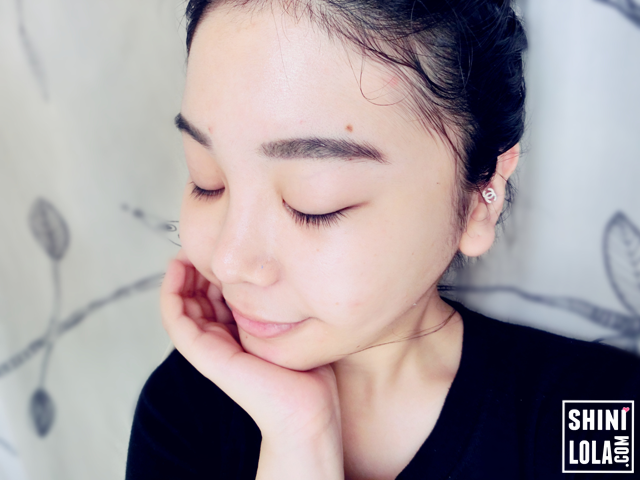 Thus, in order to achieve healthy and glowing skin, you need to maintain your daily routine very well especially hydrating your skin. Your skin might not needed for whitening, but your skin require moisturising or hydrating all the time. If you read my previous post about Za makeup, then you will know I received a gift box from them. What you don't know is the gift box is included skin care products as well. Yuppie, they sent me the latest skin care series which is Deep Hydration Range! Love the packaging because this blue shades is so shinning! 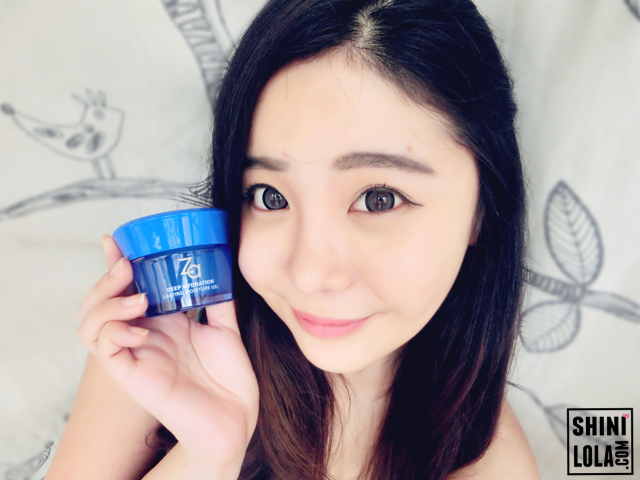 Can't wait to give it a try~ The Za Deep Hydration consists of FIVE products - Cleansing Foam, Lotion, Emulsion, Cream and Lasting Moisture Gel. 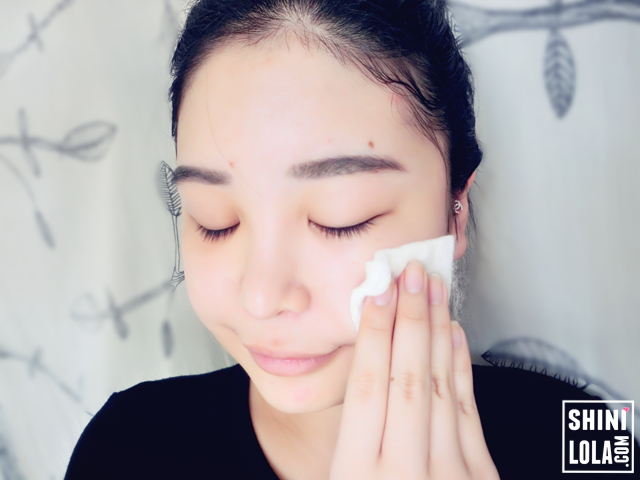 This all-new series is so easy to use; such simple steps that are more than enough to bring great hydration effect to your skin. 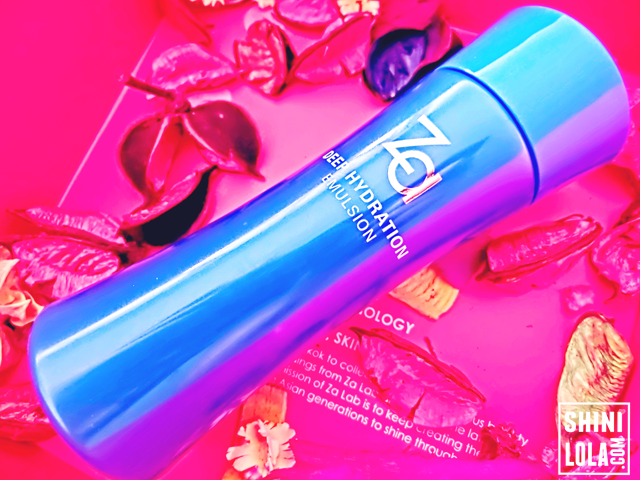 Get your skin ultimately hydrated with Za Deep Hydtation, a series packed with a full range of moisture protection to keep your skin plump and radiant throughout the day! 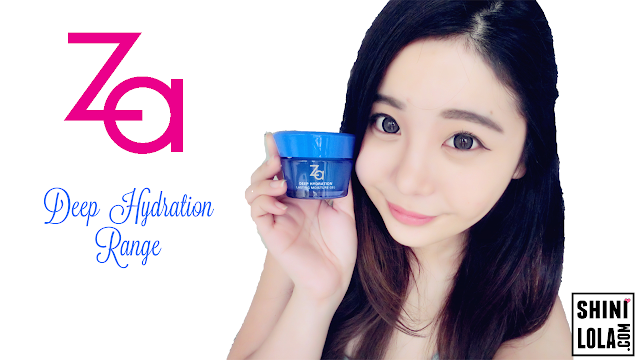 Za Deep Hydration is formulated with the "Moisture Lock-in Effect" technology that will keep your skin looking radiant, plump and supple for long hours.It targets to create healthy skin cells, seals and retains moisture within skin even when you're working or living in a dry environment. 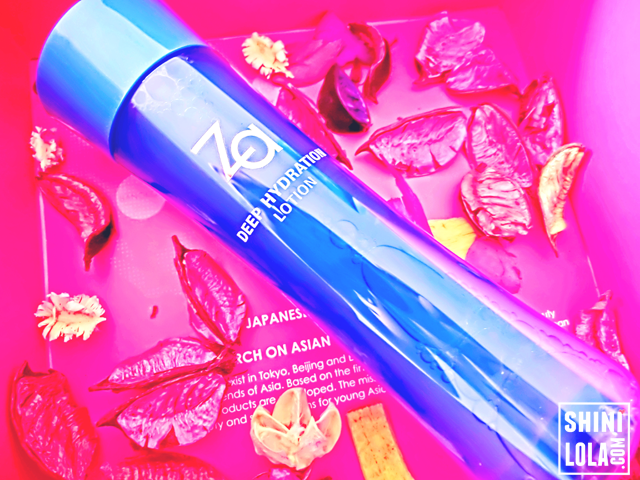 The Za Deep Hydration Cleansing Foam gives clarity to the skin by gently removing dirt, sebum and dead cells from your skin;s surface with its Hyaluronic Acid and Vitamin E-infused granules. Its rich lather washes off gently and leaves your skin feeling moisturized and refreshed. 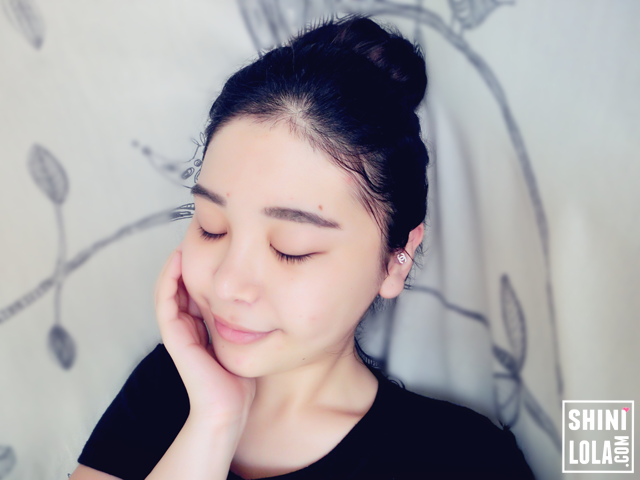 Verdicts | I can feel my skin become fresh and clean after washed my face with the cleanser! I love the facts that the cleansing foam consists of those little tiny things which can clean the pores so well. It's good because our pores always cover with those dirt or makeup, so that's why I always told my readers you must remove your makeup clean & clear and follows by using a good cleanser for double cleansing. Or else pimples will come say hi to you. Coming in a 150ml bottle, the Za Deep Hydration Lotion is the next step to use in this series. This hydrating toner is moist type lotion that swiftly penetrates its hydrating benefits into skin. It keeps your skin looking radiant, plump and moisturized after each use. 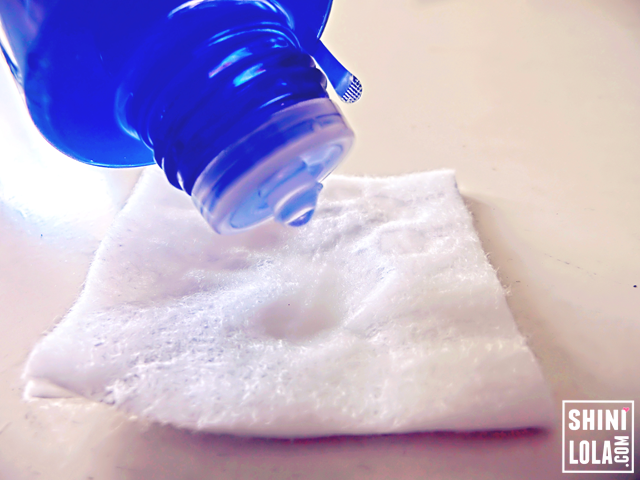 Directions | Pour a few drops on the cotton pad and gently wipe it on your face with upwards and inner to otter direction. Verdicts | I can feel my pores become smaller after applied the lotion. It does make my skin even more moisture and plump. 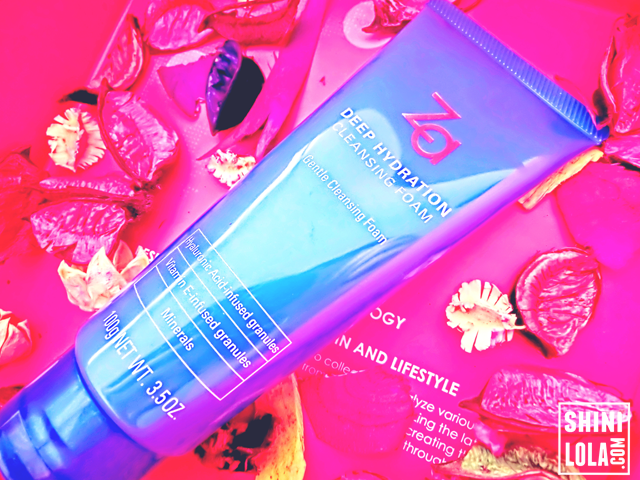 Keeping your skin hydrated and moist is the Za Deep Hydration Emulsion. Despite being in a dry environment, this fresh and moist emulsion has great hydrating benefits that will keep your skin dewy and supple. With its invigorating green scent, you will feel refresh and comfortable all-day long. Directions | Same as lotion. 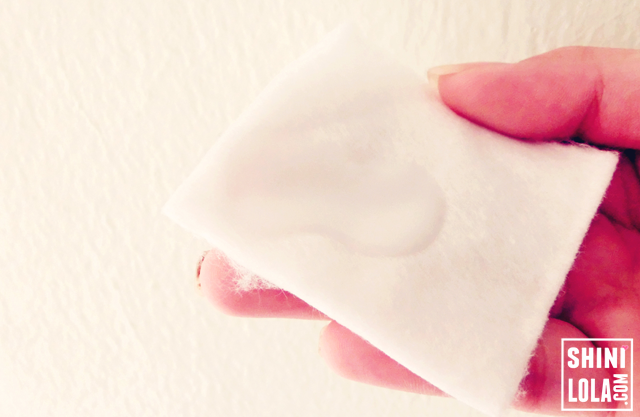 Pour appropriate amount of the moisturizer on the cotton pad and gently wipe it on your face. Apply on the neck as well if any exceed amount. 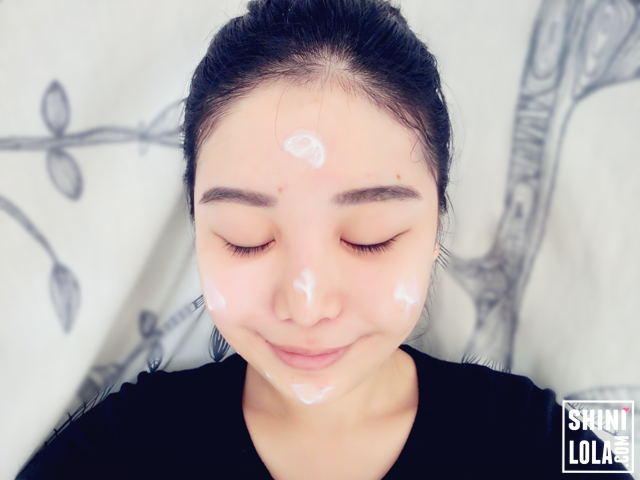 Verdicts | After applied the emulsion, I can feel my face's moisture level is even higher! Apply emulsion is another critical step because emulsion helps to lock the moisture of your skin after you cleanse and apply lotion. Remember don't apply too much on your skin. Appropriate amount would be enough. 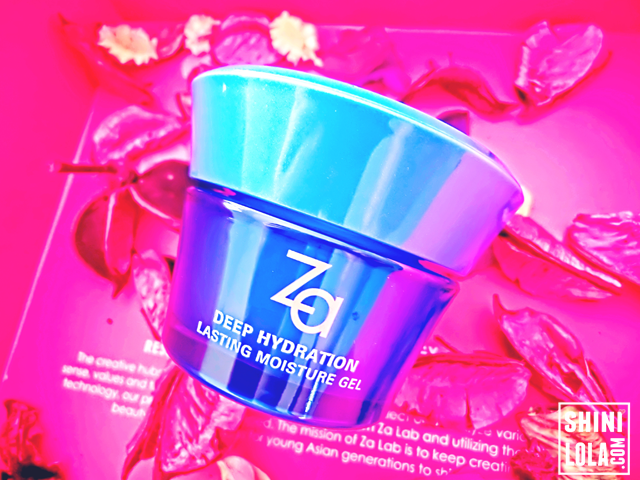 The Za Deep Hydration Lasting Moisture Gel is highly-permeating dewy gel that blends perfectly into the skin. 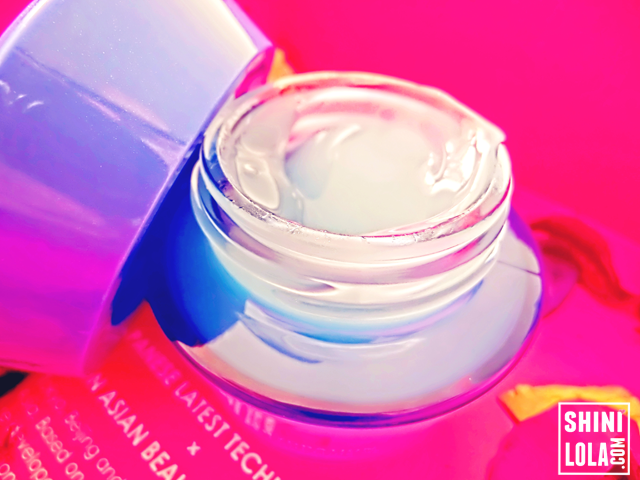 Formulated by three different types of moisturizing complexes : Triple Hydrating Complex, Double Hyaluronic Acid and Marine Moisture Complex, this beauty essence delivers up to 12 hours of lasting moisturizing effect! To achieve a fully moist, plump and lustrous skin, this will be the perfecto solution for you. Yes, this is the star products among this range so don't missed it! Directions | After washing your face, apply several dots of essence to your face and spread it out gently and evenly. 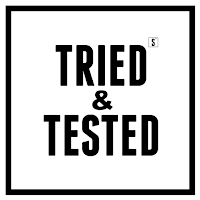 Verdicts | 30 minutes after application, I can see the effect instantly! The moisture level is turning to the maximum. I can feel my face is so plump and moisturized. Za claims that the moisture content becomes 130% at 12 hours after application. I hope my face can become more "doink doink" elastic after apply it for long term. 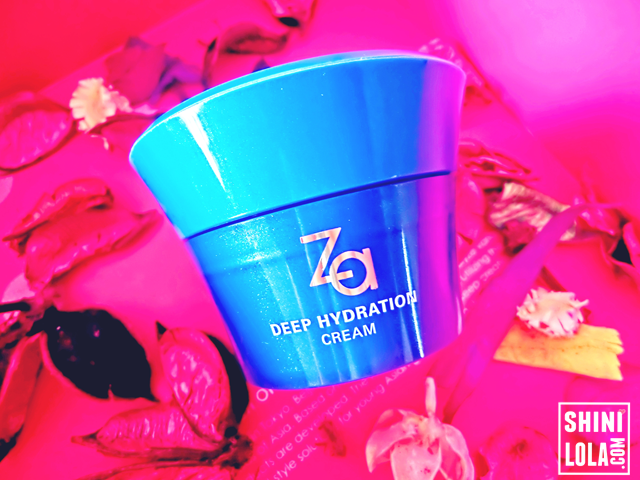 Allow Za Deep Hydration Cream to work its ultimate hydration magic for you throughout the day! Use this beauty cream just before you hit the sack or stepping out of your house, and find your skin feeling much softer, smoother and suppler. Noted | Please apply the appropriate amount regarding on your skin type. 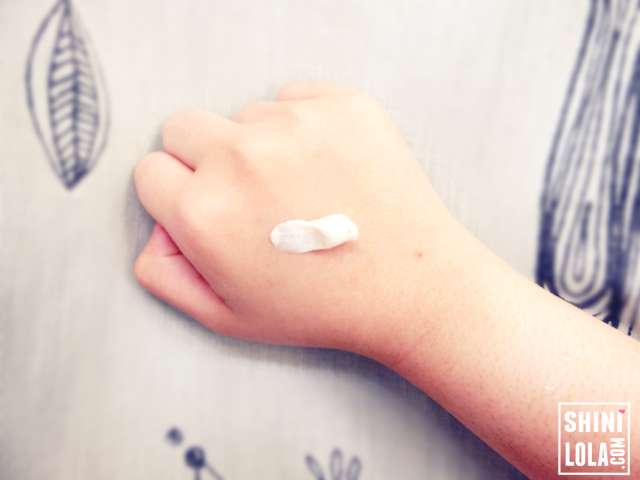 If your skin is really oily, apply more on yout T-zone area and gently massage your face. 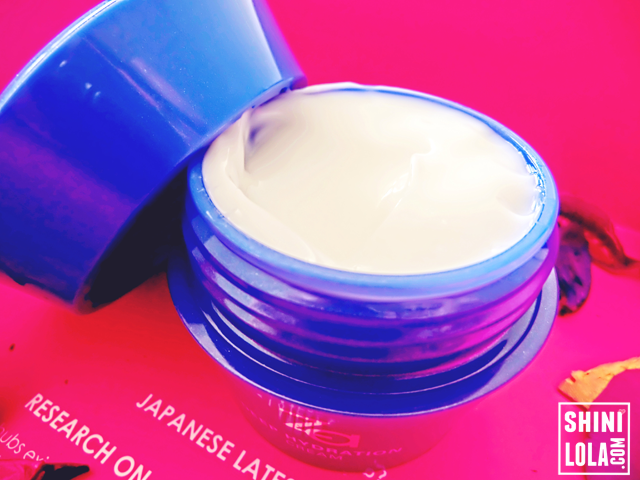 Verdicts | Last but not least, the deep hydration cream! We all know cream is the final steps except for sunscreen. It keeps my skin stay moisture at the same time turns my skin become softer. 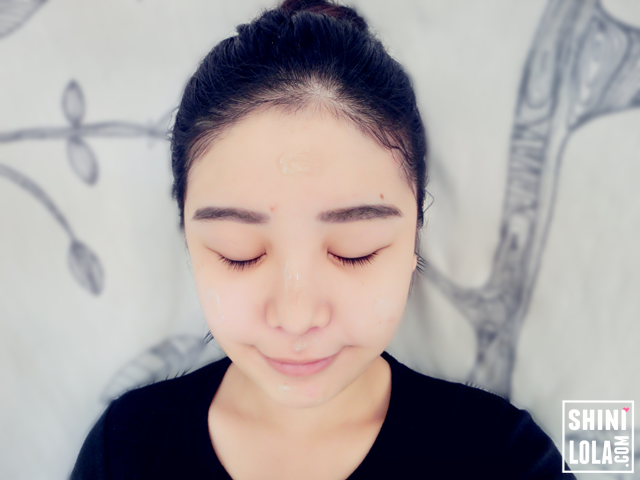 You can obvious my current skin condition according to my photo above. The result was marvelous! 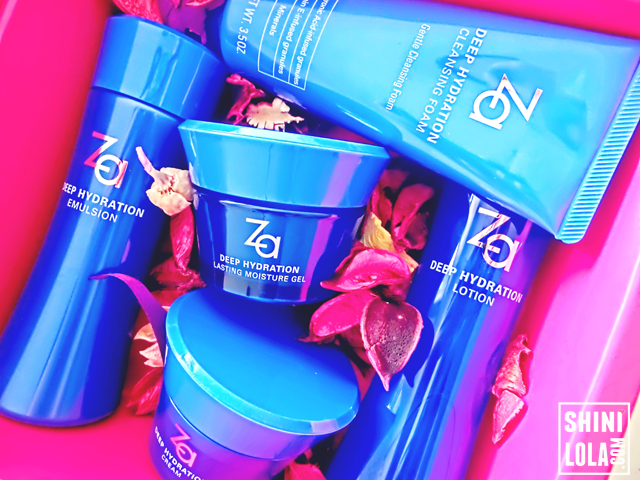 The Za Deep Hydration Range will be available in all major pharmacies and supermarkets starting January 2016. 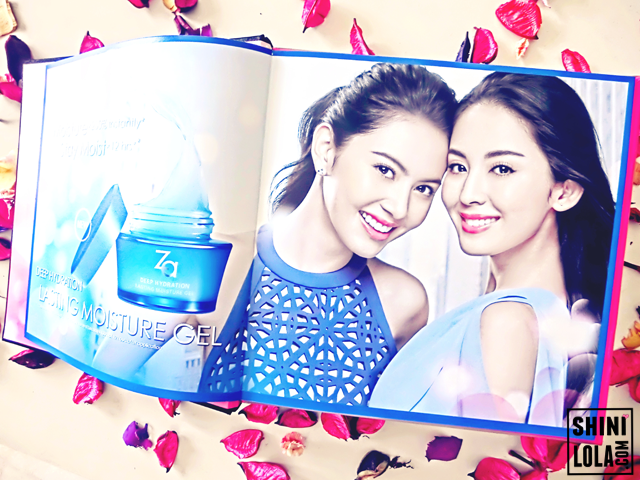 Go grab it now to achieve perfect skin before Chinese New Year coming!